Our amazing honeymoon adventures to southern Africa! Jason and I are probably the perfect demographic for Traveler’s Joy, and its wonderful service offering. We were in our mid 30s when we got married (on October 29th of 2006), and both had fully stocked homes before we met – it was more of a challenge to purge down to one set of everything, than it was to think of what we could possibly need as wedding presents. So, other than a short, more traditional list of items that people could bring to a bridal shower, we pointed everyone toward our Traveler’s Joy registry instead. 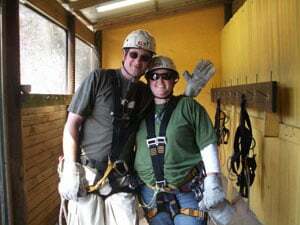 Another reason that we are the perfect demographic for this offering is that we both love to travel, and to adventure together, and therefore creating lasting memories together on our honeymoon was significantly more important for us than new china or silverware – and those who know us know that! So, we picked a place in the world that neither of us had been, that both of us had dreamed about, and was appropriately different enough for a really special adventure and honeymoon. Southern Africa! Unfortunately, the time of year in which we got married was not the right time of year to head there on safari, so we decided to postpone our honeymoon for about 9 months, until this past August, when it would be a much better time of year to be on safari. When we first started to research the trip, largely to book our air tickets (we used frequent flier miles, as I used to travel a lot in my old job), and to set up our honeymoon registry with Traveler’s Joy. The original thought was that the entire trip would be in South Africa, as that one country contained everything that we were looking to do. However, as we began to talk to folks who used to live there, or had been there before, we realized we should widen the scope. Therefore, the trip ended up being in, or at least touching on, four countries – Botswana, Zambia, South Africa, and Mozambique. We were gone from August 1st through the 27th, and spent in the neighborhood of $20,000 on this trip. Yes, it is a lot of money, and it could have been done for a whole lot less. But, we were there at the peak time of year for safaris, stayed in top-of-the-line safari camps, went to an incredible resort off the coast of Mozambique, and stayed in a five star hotel in Victoria Falls as well. We spent significantly less money on the South Africa portion, but we’ll get to that. Overall, we did the trip the way we wanted to, and don’t have many regrets at all! It was all that we were hoping for, wishing for, and looking forward to – and Traveler’s Joy played a huge part in making that happen, but I’ll get back to that later. 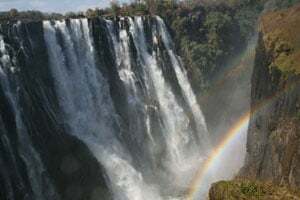 Not knowing Africa, and knowing that certain places we were headed to were much better off being done through experts, we booked the Botswana, Victoria Falls, and Mozambique portions through a South Africa-based travel agent. That way all of the transfers, including flights on little planes and larger ones, were taken care of. On the other hand, there is so much information out there about South Africa, so we felt very comfortable booking those hotels, lodges, and B&Bs on our own, as well as a rental car. Botswana – there aren’t enough great things that can be said about this experience! If you are into wild animals and you want some pictures, just let me know. And, if you ever have a chance to get there to experience it, definitely do! Beautiful country, a stable government and economy, general feeling of security when traveling there (unlike other places in Africa, of course), very friendly people, and a nation very focused on keeping their animals and reserve areas healthy for the tourist economy. We flew in from Johannesburg, landing in Maun, Botswana, for the first of our safari camps, this one in the Okavango Delta. We were met their by our bush pilot, who was from England, and much happier in the Botswana warmth and sunshine than in the English gloom. There were only two other guests joining us on that little plane – it was only a 5-seater anyway – and we flew 15 minutes to our dirt landing strip, only a few thousand feet over the ground. 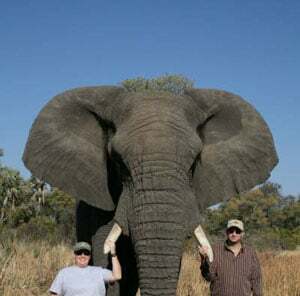 That means we could see elephants and buffalos and impalas form the plane! We landed on that dirt air strip, with an elephant there to join us – thankfully he ran off before we landed, as he was bigger than our plane was. The two of us got out, threw our bags into the Toyota Land-Cruiser there to meet us, and off we went. It’s a 50 minute ride through the Delta to our camp, and the guide told us that we would actually be getting to camp after the evening game drive left camp, so did we want to go right to camp and relax before dinner, or did we want to try to meet up with that truck to join them – no question, bring on the game drives! So, we dug out our cameras, and immediately enjoyed the ride, as four giraffes crossed our path. Before even getting to camp, we stopped for two herds of zebras, one right at the side of the track, more giraffe, some warthogs, and lots of impala and other antelope. When we joined up with the truck on the game drive, it turns out they were headed to a tree where they’d seen a leopard eating a fresh kill recently. Amazing! We haven’t even gotten to our camp yet and we’ve already seen a leopard eating away! All I can say is, thank goodness for digital cameras with lots and lots of available memory! We spent four days at that first safari camp, Baines Camp, run by Sanctuary Lodges (www.sanctuarylodges.com) – it only had five suites, for 10 guests max at any given time, and you were taken care of incredibly well. We took part in an unbelievable elephant encounter, saw amazing numbers of animals on both morning drives and evening drives, and saw hippos not only from our Land Cruiser, but also from our little motor boat on a river excursion, very close by. There’s no question that finding the two young male lions was a highlight, and coming back that evening to watch them eat their fresh buffalo kill was amazing – of course, if we’d only been there to see them take down that buffalo… Another highlight had to be the group of six elephants that hung out next to and then in front of us, munching away on the trees, letting us watch them for about 20 minutes from our truck. Just being so incredibly close to such wild animals was just priceless – and I have the 4000+ digital photos to show for it! We then left Baines, and took “the big plane” – a 13 seater – across the country of Botswana, to Kasane and Chobe National Park. We made two other landings on dirt air strips, picking up and dropping off other folks, before landing on a real runway and seeing paved roads for the first time since leaving South Africa. This camp, Chobe Chilwero Lodge, also owned and run by Sanctuary Lodges, was larger and more posh. This had 15 suites, for a max of 30 guests. It was right at the top edge of a part of the National Park, so the electric fences were key, especially for keeping out the elephants that like to come up the hill and much on its trees. That’s how I was greeted that first afternoon, as I walked across the lawn to head to “High Tea” – two wild elephants right on the other side of the fence, maybe 30 feet from me, munching away on the trees. Nice! We spent two days here, doing game drives in the Park, where the herds of elephants were huge, and routinely crossed the Chobe River from Botswana into Namibia and back again to Botswana at night. More lions, including a very pregnant one with three other females guarding her, and another pride with two moms and their combined five cubs of different ages. And lots more animals I could tell you about! 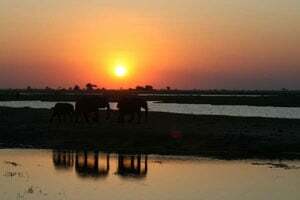 We also took an incredible sunset river cruise – more like a river game drive – where we watched elephants swimming back across the river to Botswana, crocodiles warming themselves on the shore, all sorts of birds large and small, and a huge number of hippos. Up until then, we had only seen the top of the hippos’ heads, as they spend most of their time in the water. However, as evening came, many of them went to the shore to get out of the water, so we finally saw their immense size. And, were finally able to get that desired picture of the hippo yawning – mouth wide open! As you can imagine, the night skied in Botswana were unbelievable, especially at Baines, as there was no light around for miles, other than our camp. We fell asleep one night under the stars, with our bed pulled out (upon request) onto the patio, with the mosquito net around us, and hot water bottles in our bed to keep us warm – and saw five shooting stars before falling asleep! Now that’s a honeymoon moment! As you can imagine, I could go on and on for pages and pages about this incredible trip. I’ll give you the remaining highlights, and then tell you how thankful we are for Traveler’s Joy, making this happen for us! We crossed the Zambezi River, from Botswana to Zambia, and then got into a van on the other side, to take us to Victoria Falls. We stayed at the Royal Livingstone, only a 10 minute walk from the amazing Victoria Falls on the Zambia side – the other side of the Falls is Zimbabwe. We got the great advice to stay on the Zambia side – and it was definitely the right call. We did a helicopter rider over the Falls (okay, but not amazing), and a sunset river cruise on the African Queen (kind of cheesy and very touristy, but pretty cool for the sunset shots over the river). We also hired a guide to take us through the town, give us some history, and then to the markets – first to a local market where they go daily to get their food, milk, grains, and other needs, and then to a crafts market where we could buy great art to bring home. Next, we flew back to South Africa. We rented a car there from Avis, which was definitely the company to use there, as they’re all over Africa. All of these stops were planned on www.safarinow.com – a wonderful website with reviews and secure booking capabilities, including secure querying – none of the places had my information until I actually booked with them, which made me feel good). 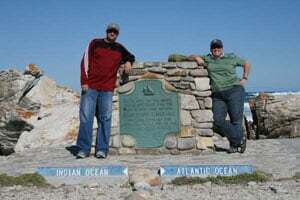 We started in Cape Town – a wonderful city where we could have spent more time – drove down to Cape Point to that lighthouse, at the most south-west point in Africa, and then started our trip along the coast. Gansbay for great white shark cage diving, Hermanus for whales, Cape Agulhas for the southern most point in Africa, and where the Indian Ocean and the Atlantic Ocean meet, the penguin colonies at both Simon’s Town and Betty’s Bay, and Mossel Bay. Craft fair on the road to George was a huge find, as was the woman selling her paintings on a lawn in George. Our stay in Keurboomstrand, the town along the beach just outside of Plettenberg Bay, was another highlight. Our two mornings there were welcomed first by a whale doing a series of five breeches just outside the wave mark, while we watched from our balcony, and the next morning a series of five or six pods of dolphins cruising by, each taking a few minutes to surf the waves as they went by. Priceless! And wishing I had an even longer lens for my camera! We also had an awesome whale-watching boat ride, with an incredibly close-encounter with Southern Right Whales – boy, are they beautiful! Don’t forget about ziplining through the Tsitsikamma National Forest! Next stop, Addo Elephant Park with a wonderful guide, who knew the elephants’ pattern. So, we knew just where to be when they were on their way to the water hole, and they walked all around our vehicle, close enough to tough (not that I would – they are wild, after all), and a memory burned into my brain. We made our way back to Johannesburg, and flew to Mozambique for three days at a beautiful island resort, for a little bit of scuba diving, and another amazing whale-watching experience with very close encounters with humpbacks this time. Not that the trip didn’t have its challenges – the theme for us became “Another Day, Another Adventure.” Not everything goes the way you planned, but why get too upset about it. The rental car dies in the middle of central South Africa, and it takes them six hours to get us a replacement car, while we hang in a gas station. How about the scheduled power outage for about 12 hours in Plett Bay and Keurboomstrand (which we didn’t hear about until we got there), making it more challenging to find places open for meals, and the power that never really came back on in one half of our suite that night. Oh, well – thank goodness for the fireplace in the room! Or how about when we land in Mozambique, and they tell us that there is a shortage of airplane fuel, so instead of flying us to the little island resort, they’re taking us all by boat ride (only 45 minutes), with a water entrance – roll up those pants and take off your shoes, it’s another adventure! It was a total of 27 days, 15 plane flights, a 45 hour trek back from the last stop, which was our little island resort, four countries, plus our stop in Madrid to and from Africa, for a total of five currencies (although mostly US Dollar and South African Rand), and well over 4000 digital photos. But it was a lifetime worth of memories! Traveler’s Joy allowed our family and friends to “buy us” pieces of our trip, the same way they could give us some china or silverware. Only for us, this was much more valuable! By having on our honeymoon registry the wide variety of things we were going to do, at different price points, it allowed people the opportunity to get for us what was most meaningful or connected to them – our friends who scuba dive gave us dive time in Mozambique, friends who love to eat gave us meals in the safari or along our South Africa travels, friends who love to adventure gave us the random things on our trip. There was something for everyone to give us! We were given a total of around $6100 from our family and friends through Traveler’s Joy, and that was key for us being able to make this trip what it became! And, to help all those who gave gifts feel more connected to the trip, in addition to the normal thank you note for the gift after the wedding, we sent postcards to them all from Africa, depending on what they gave us. I brought the Traveler’s Joy gift report with me, to make it easy to remember who gave what, and to have their addresses for all those postcards! I think that a lot of people appreciated getting that postcard from Botswana or Cape Town or the Garden Route or Victoria Falls or Mozambique – thanking them for being such an integral part of our honeymoon adventure! Thanks, Traveler’s Joy, for making it so easy and so fun, for everyone involved, both us and our guests!